A Marine Corps commitment to enhance and transform family readiness programs has leadership searching for highly motivated volunteers to join the project. The Marine Corps is canvassing all bases across Okinawa, looking for qualified candidates to fill Family Readiness Officer positions and serve in the revitalized Marine Corps Family Team Building (MCFTB) positions. Read More! CAMP LESTER Okinawa, Japan—The first baby born in 2008 at US Naval Hospital Okinawa Japan is Vaughn Dimapilis, a baby boy born Tuesday, January 1, 2008 at 1:42 a.m. Read More! Michelle Strong from California has been on Okinawa six months and says she is “having a fabulous time.” She was the winner of four tickets to the Christmas Fantasy ’07 event at Okinawa Zoo Park. Read More! Say ‘Merry Christmas’ to David Ralston, and watch his smile beam from ear to ear. 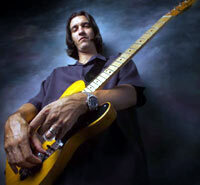 The popular blues musician is celebrating, and rightfully so. Read More! 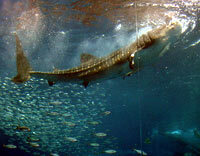 Nearly 10,000 visitors flock to Churaumi Aquarium each day, most hoping to catch a glimpse of giant whale sharks feeding. Churaumi, Asia’s largest aquarium—and second largest in the world—is an aquatics leader in breeding the giant whale sharks, which grow to lengths of 26-30 feet. Read More! There’s a baseball field, soccer pitch and a large athletics area at Uragahama Park in Okinawa City, just the ticket for the sports minded gang. The park is ideal for adults wanting to play team sports, or for those seeking a place to play croquet. Read More! Environmentalists in Zamami Village are smiling a bit, pleased to discover coral in the Kerama Islands appears to be making a comeback after severe damages were discovered. Tetsuya Miyahira of the Kerama Natural Environment Preservation Committee says coral is being observed having more healthy numbers after an intensive campaign to exterminate poisonous starfish, which endanger coral. Read More! Urban redevelopment and road expansion are forcing relocation of dozens of Camphor trees along Route 20 in front of the Okinawa City Police Station, but specialists say some will not survive the transplants. The popular trees have lined Camphor Tree Street for decades, and citizens met with authorities eight times to decide the best way to save the trees while clearing the way for necessary progress. Read More! Okinawan women are clinging to the world’s longevity title, and plenty of gerontologists are taking a close look at what they’re doing right. Local women are living to be 86. Read More!